If you are contemplating a substantial new kitchen remodel, whole house renovation or even a new bathroom design you may want to learn more about charitable donations & deconstruction. 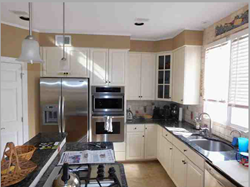 Gary Case, owner of Signature Kitchens Additions & Baths in Rockville, MD along with current kitchen design & remodeling customers Peter & Susan of Bethesda, MD learned about and made their way through the process of a substantial deconstruction donation. Peter & Susan’s kitchen cabinets were painted, standard overlay (meaning there was 2” of space between doors, think 1980’s), UbaTuba granite (think first introduction of granite tops circa early 1990’s), and their Kitchen Aid appliances were relatively new. A nice kitchen but one the owners had grown tired of. They also feared it would not win the beauty contest that the home selling process has become. Yet a kitchen that would have real value to someone else. Second Chance in Baltimore, MD. Materials donated to these organizations are tax deductible to the full extent permitted by law. The non-profit will give you a receipt for the materials, but it will be up to you to determine the value of the donation and whether or not you can take the tax deduction. For larger and more valuable donations, there is one very important IRS rule to keep in mind: if you plan to take a deduction of more than $5,000 worth of materials from your remodel project, the donated materials must be appraised by what the IRS refers to as a “qualified appraiser.” If your kitchen is relatively new and/or you have stone countertops and high-end appliances, you can easily & quickly reach that $5,000 threshold, but without a “qualified appraisal” your donation value would be capped at $5,000.00. -Step One: Consult a tax professional to discuss your proposed deduction and to determine if it is right for you. -Step Two: Hire an Appraisal firm with the proper credentials to perform charitable donation appraisals. The firm has to be able to value used building material. This is really the most important part to get right because you need a defensible document in case your deduction is ever questioned by the IRS. To follow IRS guidelines and claim the tax benefits for a large donation the IRS requires an accurate inventory of the items donated and their value determined by a qualified appraiser. For the job discussed, Peter & Susan used NoVaStar Appraisals. NoVaStar came out, took pictures and some measurements. They then sent to the homeowner a Charitable Donation Proposal. Part of that proposal was their price to complete the appraisal and provide the documentation. The price was $2,000.00. Other appraisers have different & possibly lower price structures. -Step Three: Choose the tax exempt charitable organization you are going to donate to. They must be a qualified 501(c)(3) charity. You cannot donate your kitchen to a neighbor or your daughter. Make sure they prove to you that they are a 501(c)(3). For this Bethesda kitchen remodel we used Community Fork Lift in Hyattsville. -Step Four: Choose a deconstruction company. Do not hire your average demolition company. Signature Kitchens Additions & Baths deconstructed Peter & Susan’s kitchen. Who could be more qualified to take a kitchen apart than a kitchen remodeling company? A deconstruction company’s attitude should be: all donate-able material that comes out of this house must come out intact & in good condition for re-installation in someone else’s home. -Step Five: The charitable organization communicates i.e. documents with the appraisal firm that they have in fact received the kitchen, bathroom or whole house material, and signs the IRS Form 8283, acknowledging receipt of the materials. -Step Six: The appraisal firm forwards to you, the donor, the signed IRS Form 8283 and the appraisal, which you forward to your accountant. -Step Seven: When your remodel is complete, especially if it’s a kitchen, sit back, enjoy your new space and smile while you contemplate the free lunch you will receive in the upcoming tax season.